This Congress notes with utmost concern recent statistics on the impoverishment of the people of Cornwall, which is poorer than any county in England. Working people in Cornwall are up to £1,117 a year worse off than they were in 2010 and wages are the lowest in Britain with average earnings from employment almost £100 a week lower than the national average. The GDP of Cornwall is only 76% of the EU average. Seventeen areas in Cornwall are ranked amongst the most deprived in Britain. 14.2% of homes across Cornwall are in fuel poverty. In parts of Penzance 41% of children are growing up in poverty. Low wages, poverty and lack of prospects of a decent life are blighting the lives of families and communities and driving the younger generation away. This dire situation is not only founded on cruel austerity measures and lack of infrastructure and community support but also on centuries of plundering of the rich resources of Cornwall and the oppression and exploitation of its working class and their families. The picture is all the more stark when set against that of wealthy visitors who treat Cornwall as a beautiful playground, oblivious of the poverty in their midst. Congress holds that this class-based and callous treatment must not continue and holds that what is necessary is the building of a broad movement of challenge and the articulation and promotion of a very different people-focussed agenda in which poverty is eliminated. Towards this end, Congress welcomes the recent establishment of a trades union council in Cornwall and the significant strides it has already made. Congress in particular congratulates the Cornwall branch of the CPB and individual comrades for all their work in supporting and revitalising the labour and progressive movement and for their class-based contribution to the economic, political and cultural struggle of the Cornish people for a just future in which their progressive aspirations are realised. This District Congress resolves to promote and support the development of the class struggle in Cornwall, especially by supporting and strengthening the Cornwall branch of the CPB and the efforts of all its members and by raising the issues central to this resolution in our Party at every level and in the broader labour and progressive movement in the region. Congress calls on the incoming District Committee to take forward this work as a matter of urgency and priority. 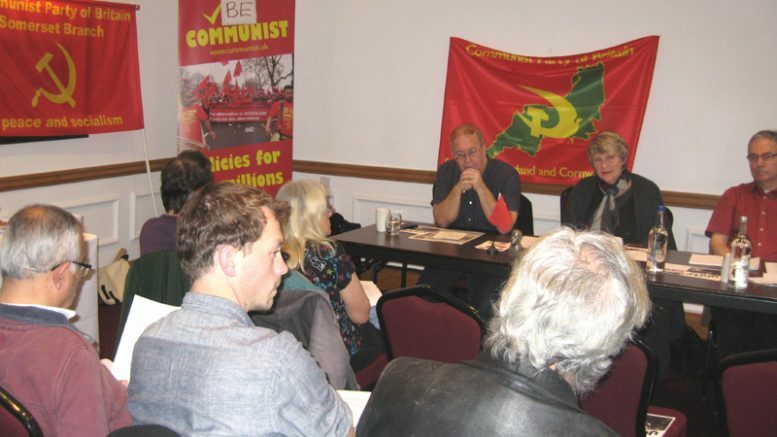 Be the first to comment on "SW ENGLAND & CORNWALL DISTRICT COMMITTEE, COMMUNIST PARTY OF BRITAIN, Resolution passed by the District Congress, held on Sunday 19 October 2017 in Exeter"